This recipe is taken from “Cook’s Illustrated Cookbook”. I took it out from the library, and it’s due back soon. I think I may just end up buying it from the bookstore since there are many, many recipes in here that look so good! The recipe calls for “1 pound semisweet chocolate, chopped”. I used semi-sweet chocolate chips. I weighed them out to a pound and then measured them after and it worked out to an exact 2 1/2 cups. I used instant coffee sachets when I first started making this cookie as I wasn’t sure how it would go over. I buy a big jar of instant coffee now since this recipe has turned into a family favorite. 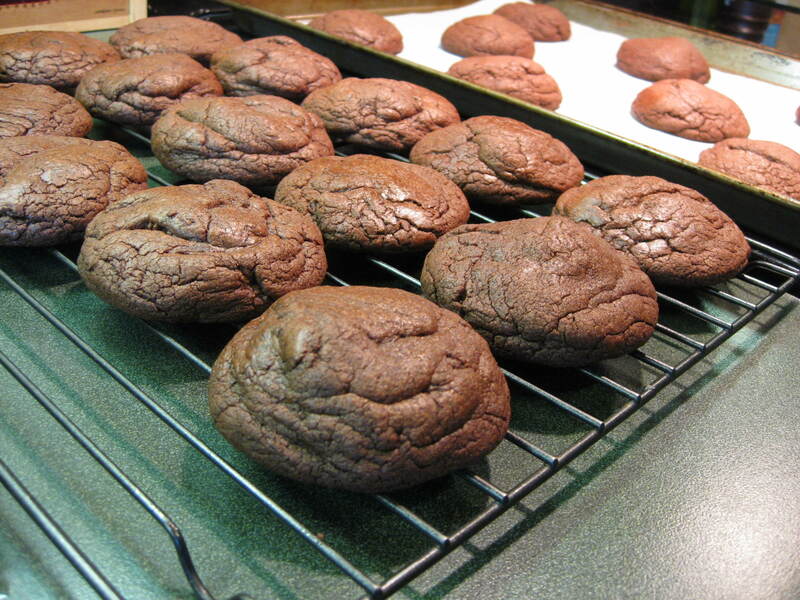 I have also added the recipe for “Thick and Chewy Triple-Chocolate Cookies”. I may have to try that one next time. 1. Adjust oven racks to upper-middle and lower-middle positions and heat oven to 350 degrees. Line 2 baking sheets with parchment paper. Whisk flour, cocoa, baking powder, and salt togther in medium bowl; set aside. 2. Microwave chocolate at 50 percent power for 2 minutes. Stir chocolate and continue heating until melted, stirring once every additional minute; set aside to cool slightly. Whisk eggs and vanilla together in medium bowl; sprinkle instant coffee over top to dissolve, and set aside. 3. Using stand mixer fitted with paddle, beat butter, brown sugar, and granulated sugar at medium speed until combined, about 45 seconds; mixture will look granular. Reduce speed to low, gradually add egg mixture, and mix until incorporated, about 45 seconds. Add melted chocolate in steady stream and mix until combined, about 40 seconds, scraping down bowl as needed. With mixer still running on low, add dry ingredients and mix until just combined. Do not overbeat. Cover bowl of dough with plastic wrap and let stand at room temperature until consistency is scoopable and fudgelike, about 30 minutes. 4. Working with 2 tablespoons of dough at a time, roll into balls and place 1 1/2 inches apart on prepared baking sheets. 5. Bake until edges of cookies have just begun to set but centres are still very soft, about 10 minutes, switching and rotating baking sheets halfway through baking. Let cookies cool on baking sheets for 10 minutes; transfer cookies to wire rack and let cool to room temperature. 1. 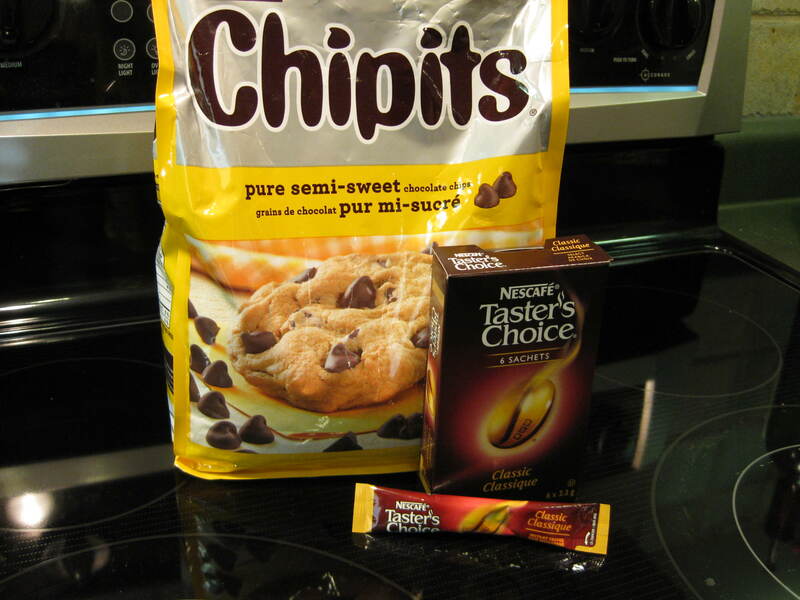 Add 2 cups semisweet chocolate chips to batter after dry ingredients are incorporated in step 3. I took this recipe from one of my favorite cookbooks,”The Complete Light Kitchen” by Rose Reisman. 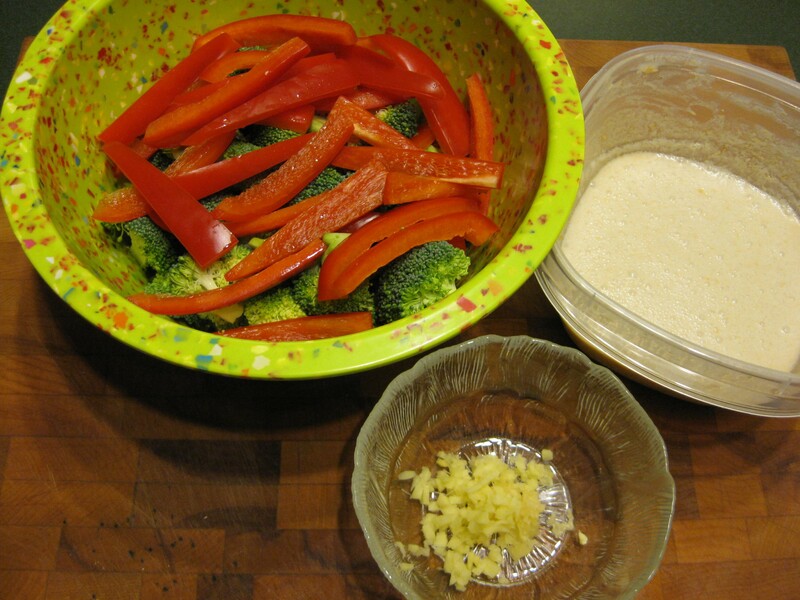 The peppers can be changed to other vegetables such as broccoli, mushrooms, or sugar snap peas. The chicken can be substituted as well to beef or pork. Make this a vegetarian dish by using firm tofu instead of chicken. I used sugar snap peas since I could not find snow peas. I cooked the whole box of rotini, and my family of 5 ate it all! They really love this dish. I made the sauce ahead of time. I also cut up the vegetables and the chicken. Having this prepared made dinner easy and quick to cook. 1. Bring a large pot of water to a boil and cook the rotini for 8 to 10 minutes, until tender but firm. Drain. 2. Combine the sugar, vinegar, water, soy sauce, sesame oil, cornstarch, garlic and ginger together in a bowl and whisk until smooth. Set aside. 3. Dust the chicken cubes with the cornstarch. 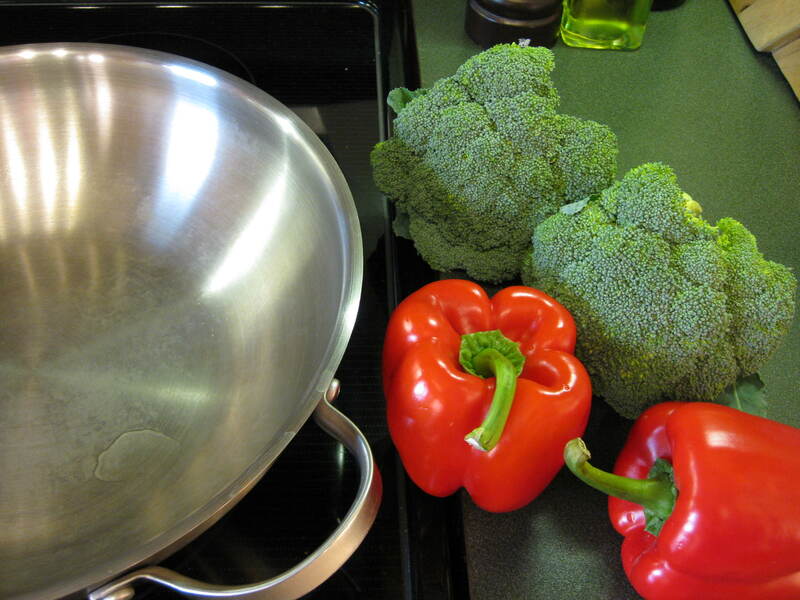 Spray a wok or large non-stick skillet with cooking oil, add the vegetable oil and place over medium-high heat. Cook the chicken for 3 minutes or until browned but not yet cooked through. 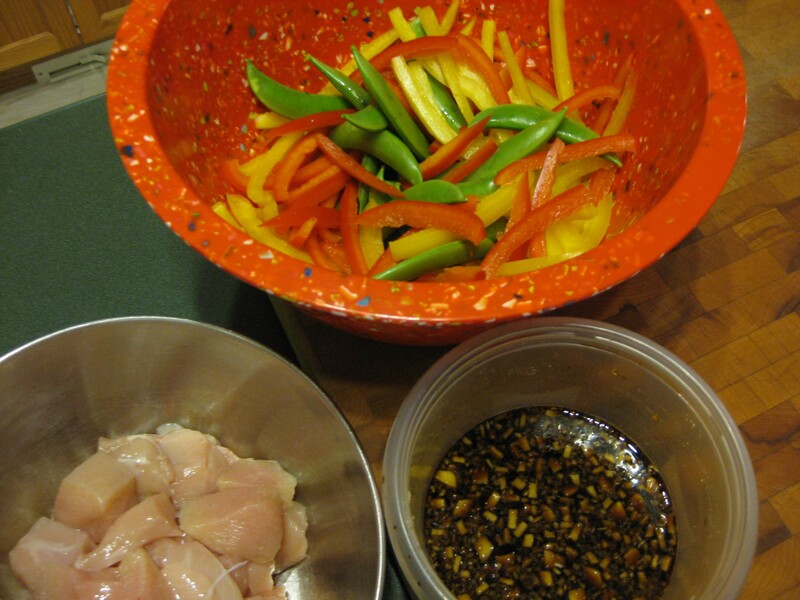 Add the red and yellow pepper, snow peas and sesame seeds. Cook for 3 minutes, until the chicken is just cooked through and the vegetables are tender crisp. Add the sauce and cook for 2 minutes or until thickened and bubbly. 4. 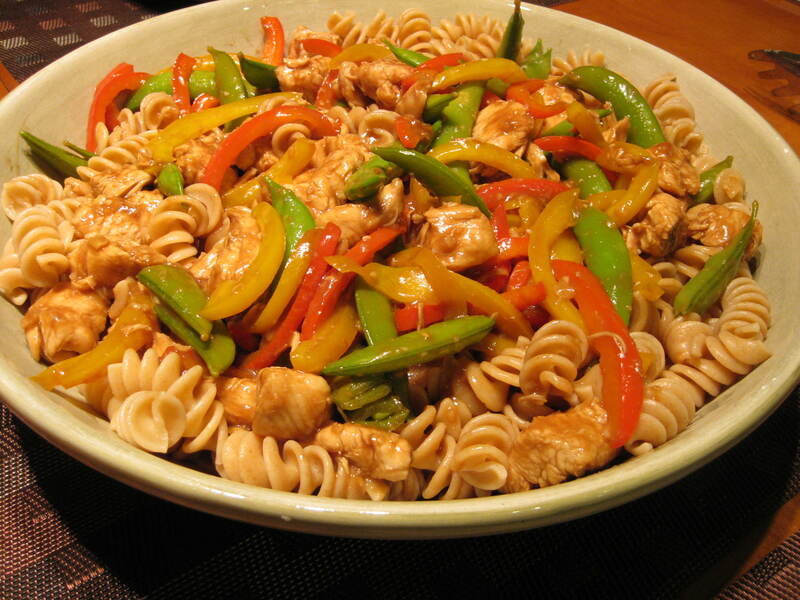 Toss the pasta with the chicken-vegetable mixture in a large serving bowl. Serve immediately garnished with cilantro. I found this recipe in The Cook’s Illustrated Cookbook. I took it out from the library, but seriously 2 weeks just isn’t enough time for this gigantic book! I am glad I found this recipe though, since I LOVED it! I made the sauce ahead of time and kept it in the fridge until I was ready to use it later at dinner. The sauce calls for 1/8 teaspoon of red pepper flakes. I used 1/4 teaspoon, but next time I would add 1/2 to 1 teaspoon as it needed more heat. I also used 2 red peppers. I did not weigh my broccoli to see if it measured 10 ounces. I used 2 stalks. The recipe states it serves 4 to 6, but my husband and I gobbled the whole thing up between the two of us! I served my stir fry with basmati rice and marinated teriyaki chicken. 1. FOR THE SAUCE: Whisk all ingredients together in small bowl until smooth. 2. FOR THE VEGETABLES: Heat 1 tablespoon oil in 12-inch nonstick skillet over high heat until shimmering, 2 to 3 minutes. 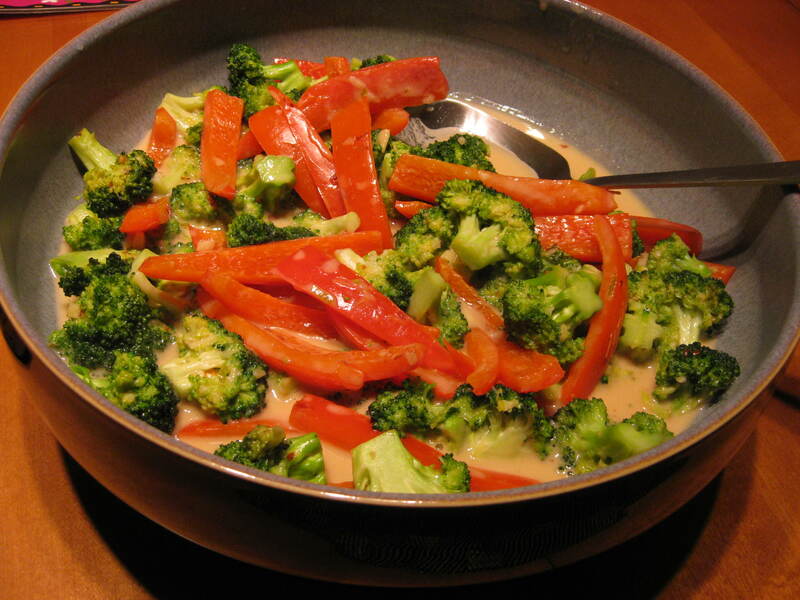 Add red pepper and broccoli and cook, stirring every 10 to 15 seconds, until just barely tender, about 2 minutes. Clear center of skillet; add remaining 1 teaspoon oil, garlic, and ginger and cook, mashing mixture into pan, until fragrant, 15 to 20 seconds. Stir mixture into vegetables. Reduce heat to medium-low and stir in sauce mixture. Simmer to heat through and blend flavours, about 1 minute. Serve immediately.